I am living in my golden years of residential fireplaces and wood-burning. The bookcase-flanked, brick fireplace in our house in the Center reliably heats up the living room and reaches around the corner to the thermostat to calm, at least for a while, the thirsty oil-burning boiler in the basement. The fireplace is a vintage Heatilator, a double-walled steel firebox with four lateral vents poking through the brick. The two lower vents draw in cool air, which is warmed in the space between the steel walls and exits into the room through the two upper vents. It works like a charm. In our Upper East Side apartment in the city, we live in a building built in the late 1920’s (in New York lingo this means a “pre-war” building). It too has a brick fireplace, a relative rarity in the city. While the times we use it during the winter usually number in the mid-single digits, it is a game-changer when the temperatures fall into the teens. Except for the bathroom, we keep the old-fashioned radiators off in the living room and bedroom. The valves are hard to reach and there is no middle ground with these ancient iron soldiers: turn them on and your sinuses are fried in a couple of days; keep them off and it can get a little cool in February. As for wood, most of the grocery chains carry bundles of wood in plastic-wrapped carriers. It works out to be over a buck for each stick of wood, although you can drop twice that at the high-end markets that offer better packaged gourmet wood from upstate. On the Island, given my age, I would say we have a lifetime supply of wood, mostly locust, that roundly despised but fine-burning species. We took out a bunch of them that threatened the house, and of course we are gifted with downed branches after every serious storm. I split much of it myself but have brought in outside help for the past couple of years. I swear that, every once in a while, as I reload the firewood ring by the front door, I recognize a gnarly, hard-to-split stick from years ago. How satisfying it is to throw those into the flames. Golden years notwithstanding, I’ve lived with fireplaces since first grade. Here are some of them, in chronological order. Consider this bonus holiday coverage you didn’t see coming. You’re welcome. Kirkwood, Missouri: My parents bought a new ranch house in suburban St. Louis and it had fireplaces in the living room and basement. The upstairs fireplace was rarely used because we didn’t hang out there; we hung out in the cozier den. The fireplace in the basement was used by my father, who had purchased a stubby charcoal grill designed to fit into a fireplace. Voila, winter barbecuing. In the early 1960’s, they remodeled the screened-in porch into a family room, with a third fireplace. This became the nexus of family living. We watched James Garner in “Maverick” on TV tables on Sundays and listened attentively during the Cuban missile crisis. In winter, my mother, a Nebraska farm girl, would have a fire going when we came home from school. First Philadelphia: My first multi-floor rental dwelling, a small townhouse owned by the Quakers, had a non-working fireplace. But someone should have told me before my first attempt at a fire. Thank goodness it was a modest, exploratory effort. Belmont Shore, California: Our first domicile was a stucco beach house two blocks from the water. It was built as a summer place in the 1920’s and had no central heat. But it had a beautiful fieldstone fireplace. This being California, we burned eucalyptus (it was the cheapest), and it burned as though drenched in gasoline. Alexandria, Virginia: The only chimney fire I’ve had, knock wood, so to speak, was in a rented townhouse here. I had no clue. Occupants of a passing car spotted the flames and detoured to find our front door and alert me. I consider this to have been an extraordinary act of civic responsibility. Not sure I would have done it. But I might have. Second Philadelphia: For almost six years, I worked in Philly and Jane worked in Manhattan, thus ushering in what we call the “The Amtrak Era.” The Philadelphia townhouse was an interesting place. It had a dumb waiter, a tiny sauna and a bidet. It also had a cheesy metal fireplace I almost never used. 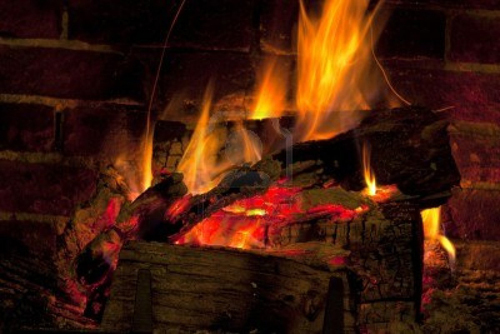 On one particularly chilly night I opened the flue in anticipation of laying a fire. A terrified, very sooty bird burst from the chimney, nearly giving me a heart attack. I watched helplessly as the bird banged into walls and ceilings — sooty splotches marking every collision — as it made its way three stories up the stairway where its journey ended in a bedroom. I closed the door, got a towel, captured the creature and released it into the night air. You tell me: If it figured out how to get into the chimney, why the heck didn’t it get out the same way? Why hide out at the bottom of the chimney when his escape route was at the top? Why maliciously choose to scare me half to death? It’s a mystery.